A classic cookie made gluten-free. I suppose you could argue that one oatmeal cookie recipe is enough. I mean, how many oatmeal cookie recipes does a person need? To this I answer, at least two. Why? Well, first you have one with raisins (my oatmeal raisin cookies here). Raisins give oatmeal cookies that old school chewy sneaky nutrition boost. They're old fashioned and comfy cozy. Kinda like spending one of those Saturday afternoons at your Aunt Martha's house, chillin'. Watching Mr. Rogers and laying on the floor with a pile of coloring books. Coloring outside the lines with a beat up box of Crayolas. Wishing the silver crayon was more than a lonely nub. And right at that nub lamenting moment she'd bring you a plate of cookies. I never had an Aunt Martha. But I did have a chain smoking platinum blond Aunt Patty who liked martinis a little too much. Or maybe it was gin and tonics. There was ice in the glass. If I was lucky enough to scrounge up a coloring book and some crayons, I would hide behind the sofa. I didn't want to hear her opinion on pantyhose or how you could tell a woman's age by looking at her knees. I'd wait out the tedious afternoon without cookies. If I was lucky, I might get some tap water Kool-Aid. Or a plastic bowl of Cheetos. Perhaps that's why I'm not a fan of raisins in oatmeal cookies. I don't have comforting memories of their dried grape taste, though I appreciate their fine qualities- in an abstract, theoretical sense. No, I'm more of a chocolate chip oatmeal cookie kind of girl. Especially when the cookies are warm and the chips are melty. Chocolate makes everything right with the world. So here's oatmeal cookie recipe number two. Bake some up this week. I say, be your own Aunt Martha. By Karina Allrich April 2010. 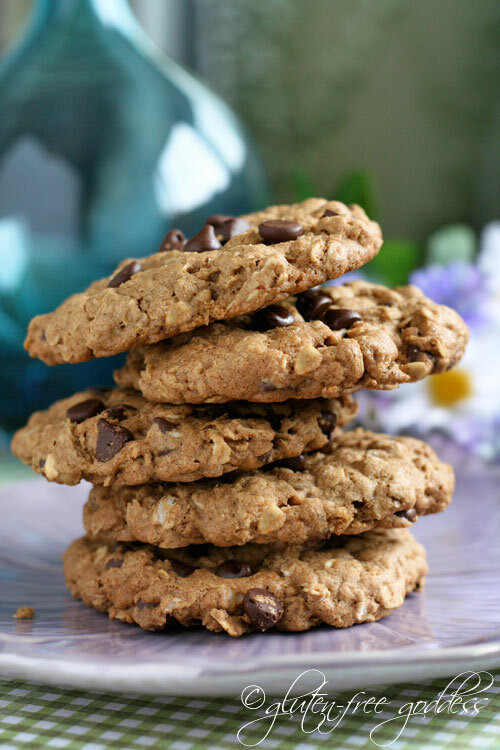 I used my favorite flours in this new oatmeal cookie recipe- a sorghum, millet and tapioca starch combo. I prefer this blend over rice flours. It's a taste and texture issue. 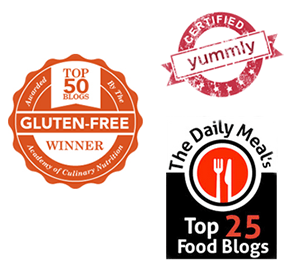 Make sure the oats you choose are certified gluten-free. Check the label (read more about oats and the Purity Protocol here). Add the whisked dry ingredients to the creamed brown sugar and beat to combine. Start with 3 cups GF oats. Mix till distributed evenly. 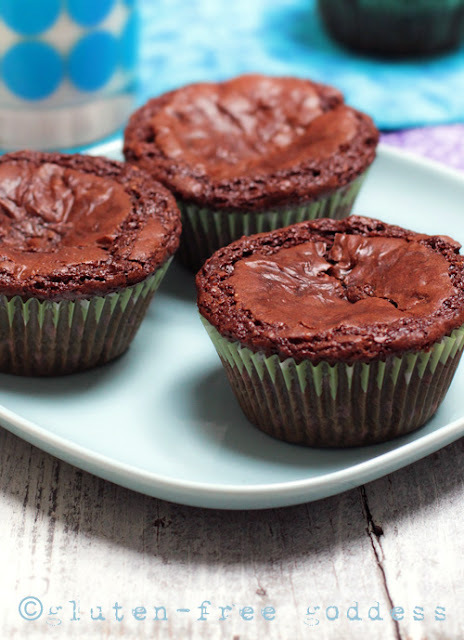 If you'd like more in the batter, add in another half cup. Stir by hand to combine. Spoon balls of dough onto lined baking sheets and press down a bit to make a cookie shape. If you like your cookies flat and crispy, press down a bit thinner. If not, keep them more rounded. If you're not sure, do a test run with a single cookie if you like, to see how much the dough spreads while baking. Bake for about 12 minutes until slightly golden and chewy. 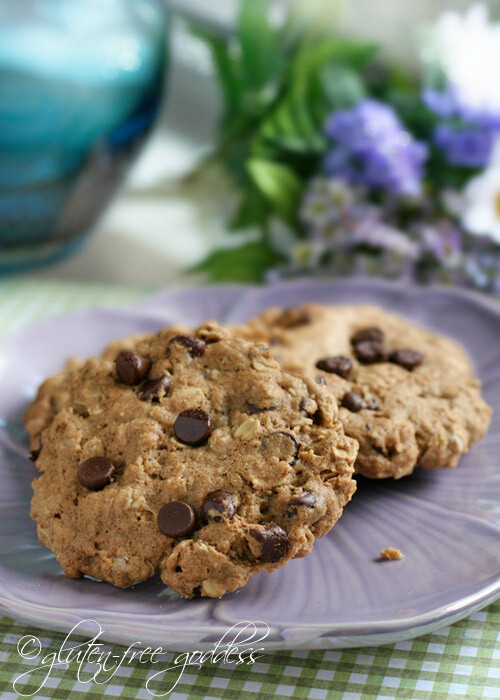 (Note: Longer baking time (15 minutes) creates a harder cookie, closer to packaged oatmeal cookies. Cool the baking sheets on a wire rack for 3-4 minutes; than remove the cookies onto cooling rack. Wrap cooled cookies in recycled foil and freeze in freezer bags for future treats. These cookies keep better than most gluten-free cookies, due to the oats, so if you'd like to experiment, keep a few in an air-tight container. Best if eaten in a day or two. 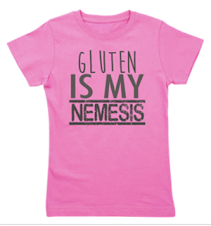 Some celiacs cannot tolerate oats, even if certified gluten-free. Possibly due to the high fiber (though this may actually help some folks). Check with your doctor if you find oats are difficult to digest.